This is a wonderful recipe for sweetened coconut filled puffs. My first try and a big hit I should say. I made use of two frozen items availabe in the US. One is the readymade puff pastry sheets and the other is the shredded coconut. I have made this recipe as simple as possible so it is easy to try this and relish the very nostalgic taste. If any of my hometown people read this post, I am sure it will bring back memories about the sweet coconut buns that are availabe in a road side shop in Agraharam, Salem. We used to buy those coconut buns when I was a small girl. It's actually a coconut filled round pie. The taste and texture are more or less the same as this sweet puff. Every weekend, we used to buy this freshly baked sweet buns. I don't know if they still sell them. Coming to the recipe, here is one easy and sweet snack that everybody can enjoy. Thaw the puff pastry sheets and the shredded coconut if you are using frozen. Cobine coconut, sugar and jaggery/brown sugar and a tablespoon of water and heat in a heavy bottomed kadai. Keep in low to medium heat. Keep stirring. You will notice that the consistency will loosen. But, after around 15 minutes, it will start thickening. Take off from heat when the consistency is thick at the same time a little moist too. (Don't wait until all the moisture is absorbed). Keep it aside and wait until it comes to room temperature. Cut the pastry sheet into three parts. Make use of the folding. Then cut each part into two. There will be totally 6 small rectangles. Take a tablespoon of the filling and place it in one side of the rectangle so that you can close the filling. Close the filling and seal the sides. A drop of water can be used to seal. Use a fork to make a design. Repeat this for all the puffs. Poke once on the top of each puff to vent. Line the six puffs in a non stick baking tray. Bake for approximately 25 minutes or until the surface is golden brown. Take it out and cool completely before you taste. The filling will be really hot. If the puffs are not sealed proplerly, there will be a leak. Discard the leaked filling on the tray. Enjoy the sweet and delicious puffs. You can as well shout 'Bam' like Emeril and sprinkle powdered sugar on the puffs before serving. Repeat these steps for the remaining pastry sheets and the coconut filling too. Thaw the pastry sheets before proceeding. This is my entry to AFAM - Coconut hosted by Suganya of Tasty palletes. Thanks suganya for hosting this event. Wow even bofore i read the recipe i knew how delicious it will be the combo. That's a very nice sweet treat. 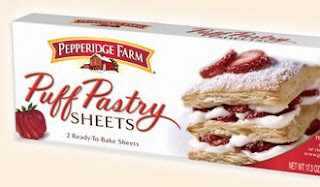 I would like to try this when I get puff pastry sheets. Looks delish. Everyone is going nutty with coconuts. I didn't know they were so popular. This AFAM is to watch out for. Lovely and I bet these are real treats for people like me .. I usedto make the same Pepperfridge Puff pastry sheets to make potato Patties but never thought of making these ..looks great . Your puffs look delicious. So cute! Hi Can I store these puffs and reheat it next day? or does it have to be consumed the same day? I had it the next day also and it was fine. May be shelf life not more than 24 hrs. Don't have to keep it in the fridge. Hi...what temp do you bake these coconut puffs and how many puffs do you yield for this recipe? Hi BDSN, try this one you will love it. Very nostalgic one. Bake at 375 degrees and the yield is around 15 to 16 approximately.